Images slow down your site. Plain and simple. But images are still essential for other reasons, so you can’t just ignore them in the name of performance. 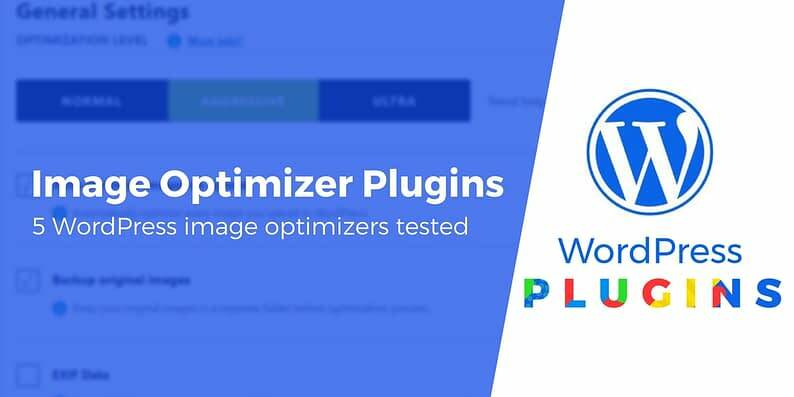 To get the best of both worlds, you can use a WordPress image optimizer plugin to optimize images so they take up way less space. You still get to use images for your readers and your site still loads fast. It’s a win-win! When it comes to WordPress image optimizer plugins, you have several quality options. And to help you find the best of the best, we’re going to put six of them to a test in this post. To start, we’ll test how much each plugin can compress a sample image. Then, we’ll jump into the actual interface for each plugin and show you how it works. To put these tools to the test, we wanted to see how effectively each plugin could optimize the same image. This gets a bit tricky, since some of the WordPress image optimizer plugins offer varying levels of optimization. 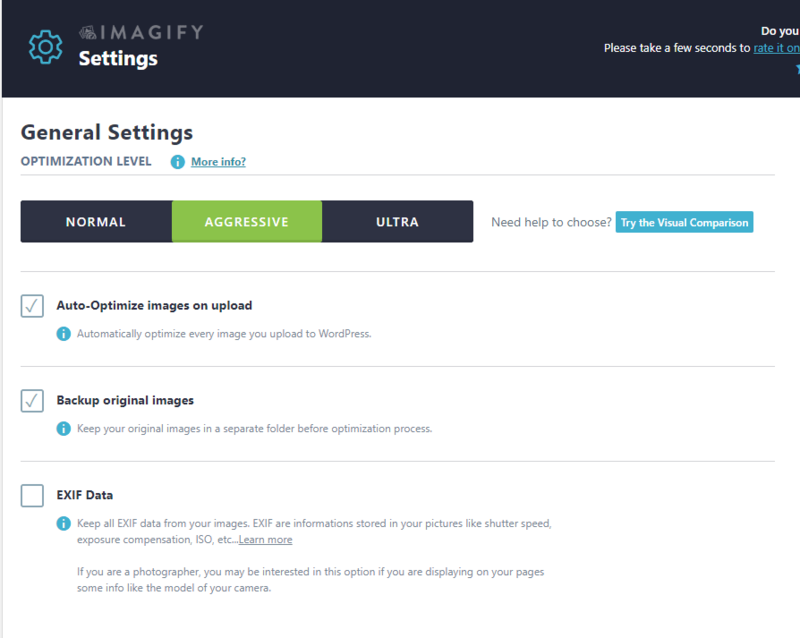 For instance, Imagify has Normal, Aggressive, and Ultra optimization modes. In addition, some of the optimizers provide automated resizing tools, which can cut down the file size drastically. 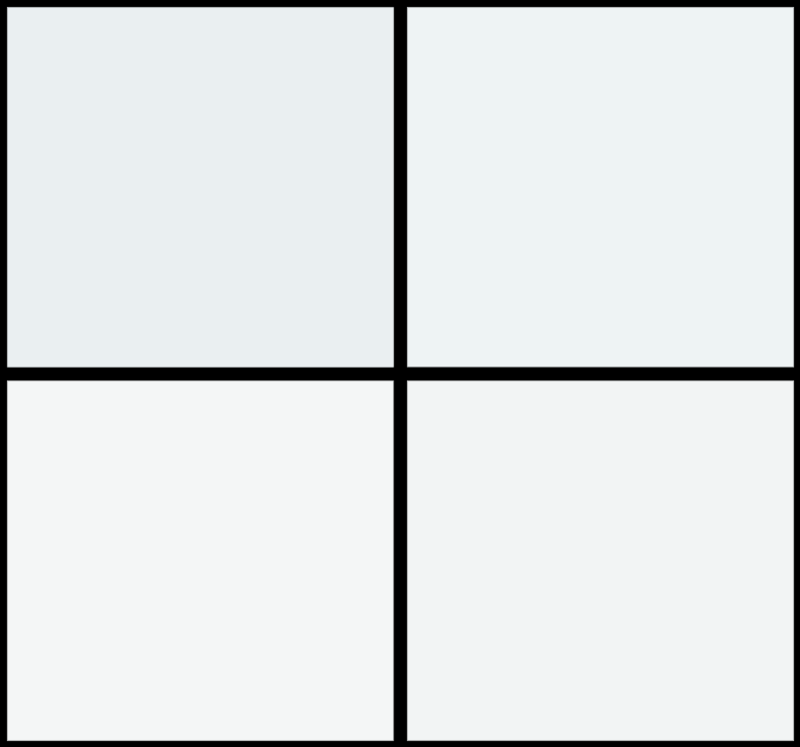 We’ll run two tests: one for JPG files and one for PNGs. 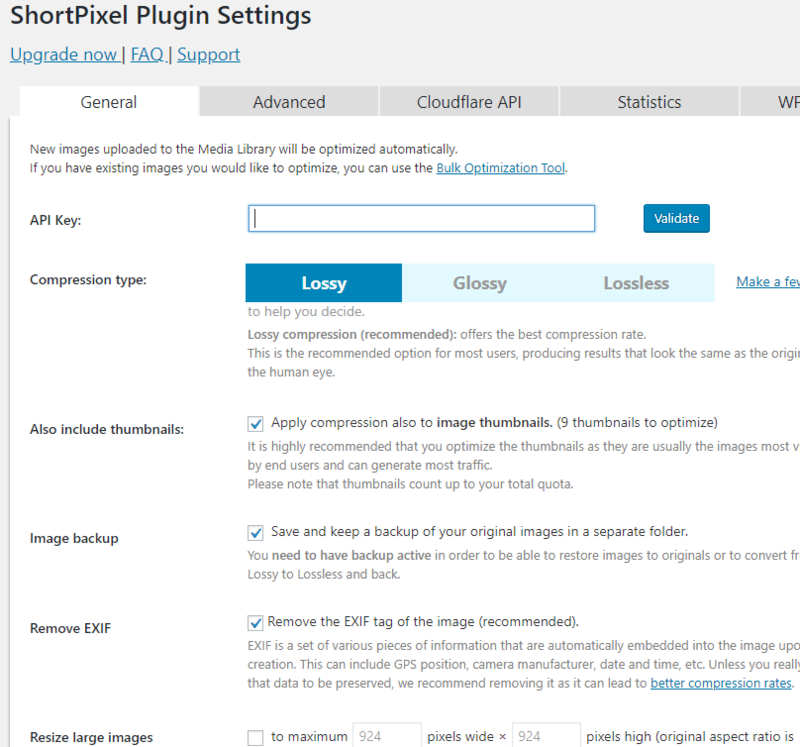 We’ll stick with the default settings for all plugins and not resize the photos at all. Though it’s not a perfect comparison, by sticking with the default settings, we’re trying to emulate the experience for a casual user. By that, we mean that the average user would typically install the plugin and not mess with too many default settings. Sticking with default settings, ShortPixel is the clear winner, coming in with a ~67% reduction in file size using its lossy compression. TinyPNG gets second place, but it’s a good bit further back. And despite still using lossy compression, Imagify only managed to shrink the image by ~34%. This time, the competition is more fierce. Now, the Optimole Image Optimization plugin takes the top spot with 88.7% optimization. Imagify, TinyPNG and ShortPixel are not far behind. As you may notice, those are the same plugins we saw perform well in the JPG test. Does that mean they’re definitely better? No. But it shows that they’re preset to perform the best, which in my mind is a huge factor. If the average user can’t accomplish a 70% compression rating without upgrading to premium or switching around settings, I’d put a plugin like that at the bottom of my list. So, after two real-world optimization tests, the winners are Imagify, ShortPixel, Optimole, and TinyPNG. 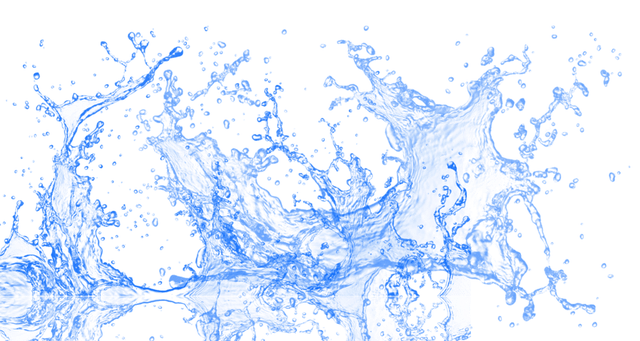 Note: You may see that the image degradation is more prevalent with extreme optimization settings. For instance, I actually noticed a clear difference in how the PNG looked through Optimole – since by default that plugin gets more aggressive with its file shrinking. Optimization is the most important element, but you still want to ensure that you’re not paying too much – or that the interface isn’t too difficult to understand. Optimole’s image optimization plugin is clean and modern, with most of the tools running in the background without you knowing. It requires a quick account creation and API key insertion. After that, you can view all optimized images in the dashboard and modify certain settings like image replacement, resizing of large images, compression quality, and lazy loading. Optimole also has its own dashboard outside of WordPress. Here you can find more detailed information like the optimization sizes and monthly reports. All image optimizations are done automatically with Optimole. It’s also powered by a CDN so you don’t have to worry about your images loading slowly. Tracking and monitoring is one of the best features, since you receive very specific details on what’s happening with your images and how much space is being saved. Along with lazy loading and image resizing, it’s a nice package without the need to pay any money. The Free plan allows for 1GB of images per month, a CDN, and 10GB of viewing bandwidth per month. Three other plans are sold, starting at $29 per month for 15GB each month and 100GB of viewing bandwidth. The CDN is also more powerful in the paid plans. Imagify has the best-looking Settings module on this list. It’s broken down into General Settings, Optimization, and Display Options, with only one page to manage settings. I like how the optimization modes are large buttons. Also, the Visual Comparison between the optimization modes gives you an idea of which one to use. In the optimization testing, Imagify performed well. However, that was on the default Aggressive optimization setting. You can also go with Normal (lossless) and Ultra (more lossy). So, you could compress your images more, or less, if you’re worried about quality. Other than that, most features can be set up for automation. For instance, you can resize all images to a specific width. There’s even a tool for optimizing your WordPress theme. Pricing is based on the actual file size of your image uploads. Less than 1GB per month is okay for the free plan, but after that, the plans start at $4.99 per month. Smush has a beautiful interface with proactive elements that ask if you’d like to optimize both old photos and new ones. The main advantage of Smush is the amount of information provided about your images and how much space you’ve saved. Resizing and optimization are both included with new and old pictures. The bulk optimize tool is great for when you have several pictures. In the free version, you can only bulk optimize 50 old images at a time, so you might need to click the button a few times if you have lots of images. 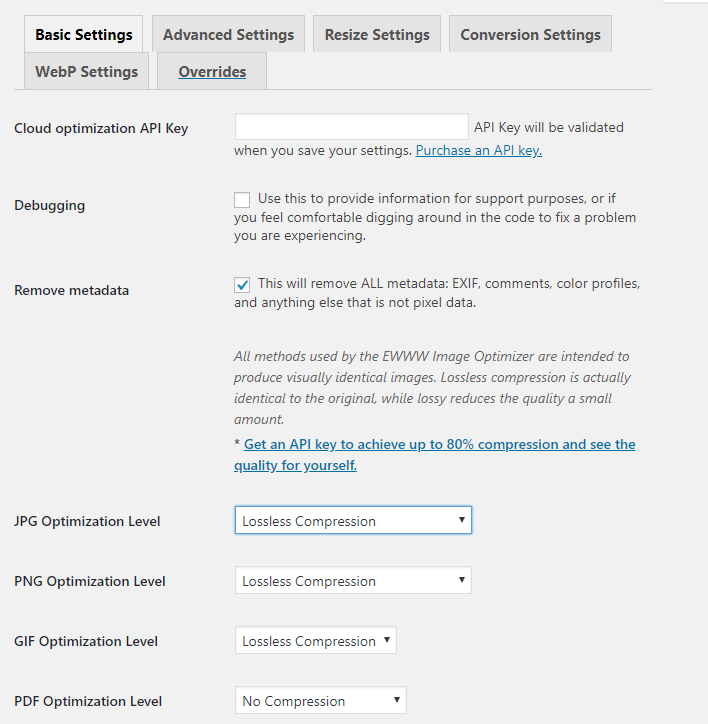 To remove that limit and get lossy compression, you can use WP Smush Pro. 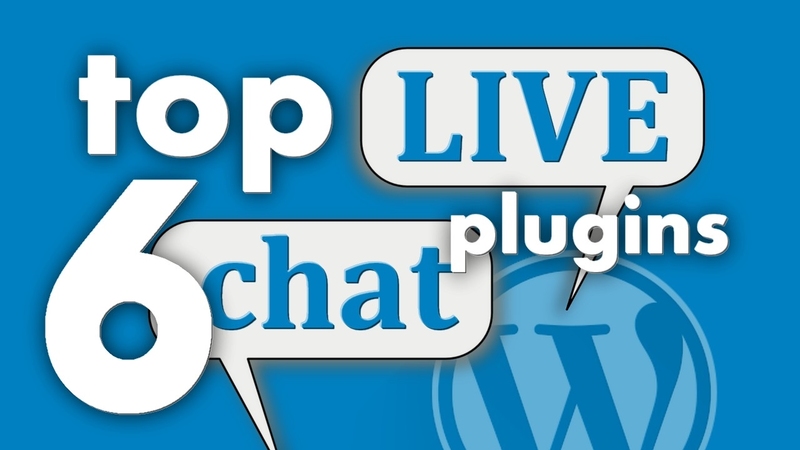 This premium plugin is included with the WPMUDEV development package for $49 per month. That’s a steep price if you only need this plugin, but many developers love the subscription since you get everything else you need for building websites. EWWW is one of my least favorite interfaces, since it looks outdated and shows six tabs that you have to sift through. That said, the default features are typically fine for most people, so you don’t have to mess with much. EWWW offers JPG, PNG, GIF, and PDF optimization. There are also options for both lossy and lossless compression. The main benefit is that EWWW has no limits on file sizes or the number of images uploaded. Additionally, the free version of EWWW performs optimizations on your own web server, whereas all the other tools use external servers. This is nice for privacy-focused sites. But it can put a strain on your server if you optimize a lot of images at once. The main EWWW plugin is free. You can also pay for API access if you do want to offload the work to someone else’s server – but you don’t need to. ShortPixel’s dashboard is similar to Imagify’s but with extra tabs for advanced features. The average user can go with the default settings, and the main page is mainly where you’ll stick around. ShortPixel lets you choose from Lossy, Glossy, and Lossless modes. You can also resize large images upon upload and see how much space you’ve saved. ShortPixel provides 100 free image credits every month. If you need more, the plans start at $4.99 for 5,000 image credits. There are no file size restrictions for individual images. 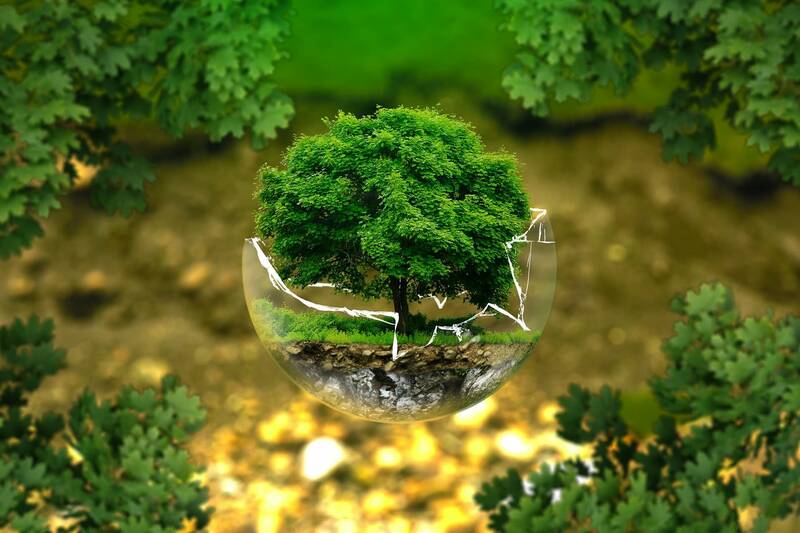 The TinyPNG plugin sticks to the basics, with a simple, clean Settings page. It takes maybe 20 seconds to understand what’s going on and activate your automated optimization process. 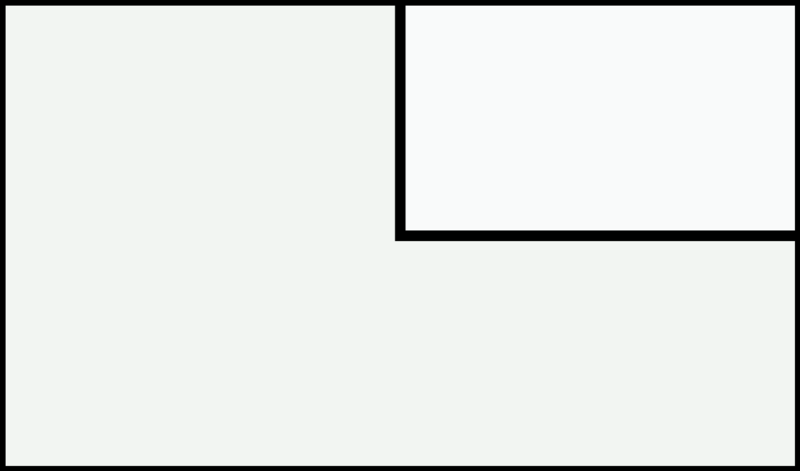 TinyPNG automatically compresses and resizes images upon upload. It also has options for optimizing previously uploaded images. Along with no file size limits and WooCommerce support, this is a pretty appealing plugin. The number of free uploads is restricted to 500 per month. After that, the starting price is $0.009 per image for the next 9,500 images. 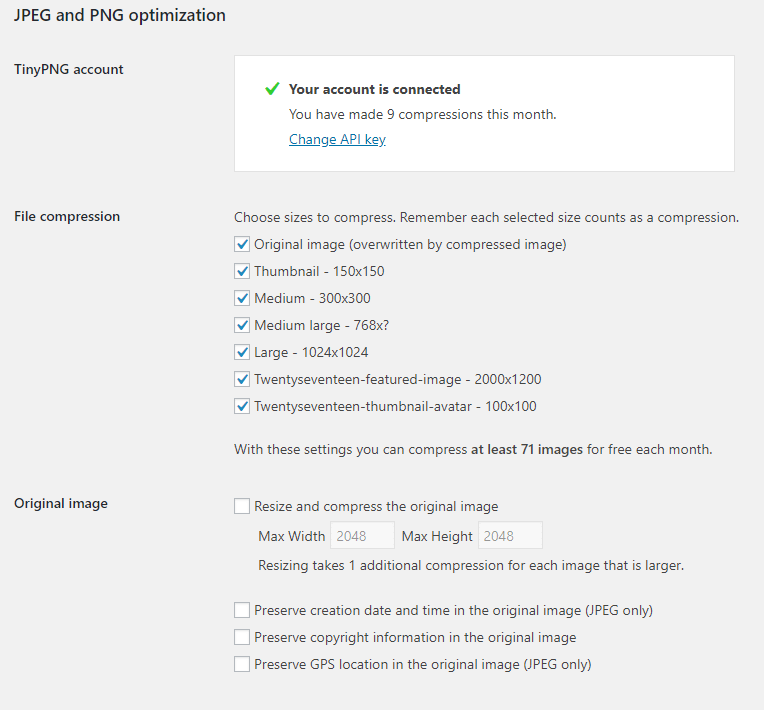 Which WordPress image optimizer should you go with? 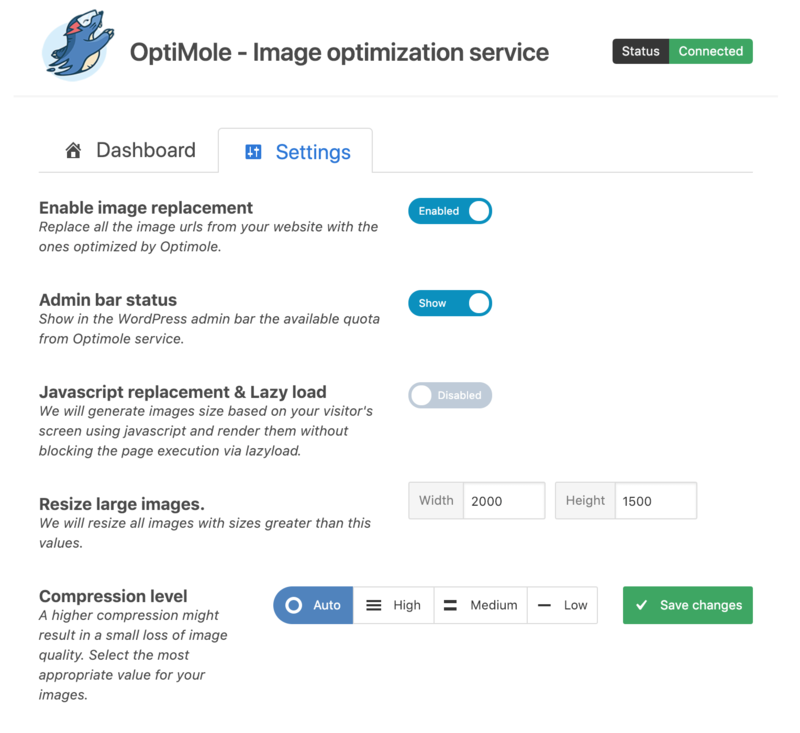 Optimole – For a fairly powerful free plan and included CDN, lazy loading, and making it possible to always display a version of the image that’s optimized specifically to the viewer’s screen and device. Imagify – For excellent compression, features, and interface. Smush – For unlimited free lossless compression (with a 1MB max for each image). 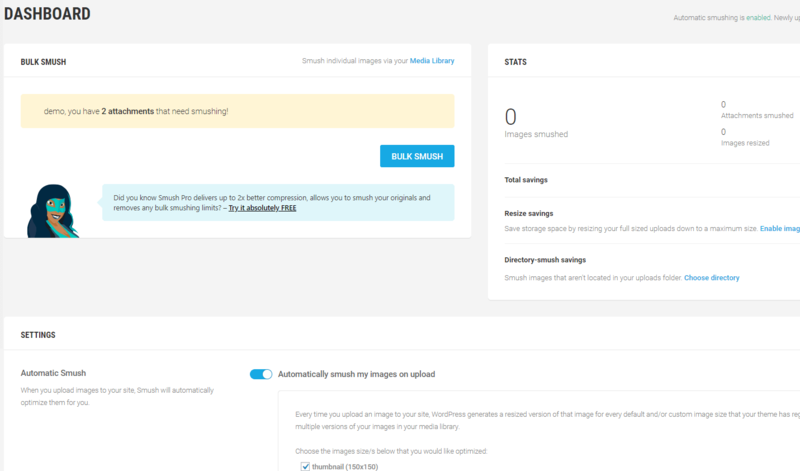 EWWW – For a free WordPress image optimizer and no file size limits. Just remember it works on your own server. 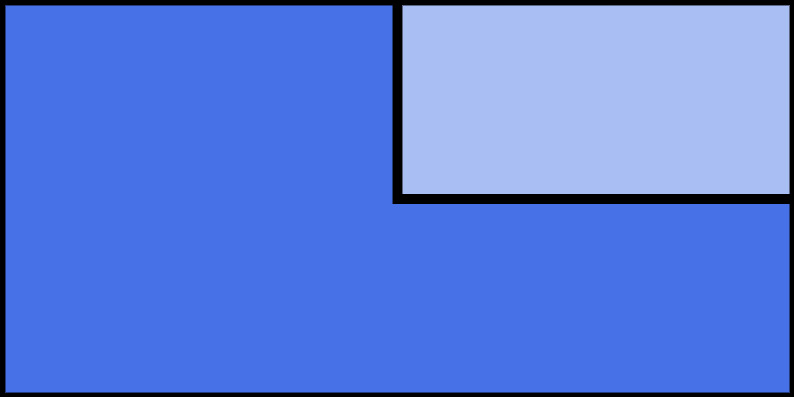 ShortPixel – For some of the best optimization and a sleekest interface. TinyPNG – For excellent optimization and the simplest of all interfaces. If you have any further questions about the best WordPress image optimizer tools, let us know in the comments. Joe Warnimont is a freelance tech writer who enjoys playing around with WordPress and his personal blog. When not testing new apps and gadgets, he’s brushing up on his German or riding his bike in Chicago.